First Tennessee’s big real estate move later this year will shift hundreds of employees from one struggling office market to another, from Downtown to the airport area. It remains to be seen how the shift affects either commercial real estate submarket. The office vacancy rates for Downtown is 19.8 percent and 22.8 percent for the airport area, according to the latest CBRE Markeview report. 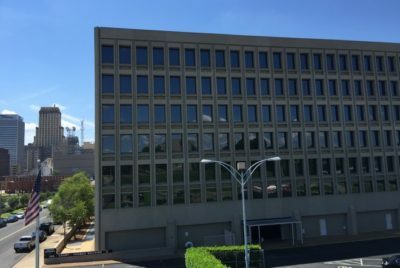 Nothing’s happening to the well-known First Tennessee Building at Main and Third except a continuing, $3.5 million renovation and the addition of 200 employees for the 25-story headquarters. But three blocks away, the bank’s less known back-office building — no First Tennessee sign, logo or branding is easily visible from the streets — will be vacated and put up for sale. Five hundred to 700 people work there. First Tennessee built the eight-level (counting the basement), 228,000-square-foot Court-Thomas Building in 1971 and has owned and used it for such non-retail functions as loan operations and enterprise technology. Many of the bank workers there will be moved to another back-office building near the airport; the bank calls the 181,000-square-foot structure at 3451 Prescott Road the “First Ops West’’ building. Built in 1995 and expanded in 1999, First Ops West will see the number of its employees climb from the 400 now to nearly 1,000. The bank is renovating and updating the building for office use. Still, the growth will not necessarily radiate across the airport office district, indicated commercial real estate broker Joe Steffner. “The fact they are moving people to the airport means they are putting them in less expensive space,’’ said Steffner, regional managing director for Newmark Grubb Frank Knight. He’s also president of the Memphis Area Association of Realtors. First Tennessee will not be filling available space in the airport district. “Unless they have taken a half-million square feet it’s not going to make a difference because there’s so much vacancy down there,” Steffner said. First Tennessee is reducing its real estate footprint and consolidating employees across the state. But no adjustment involves more people than the Court-Thomas/First Ops West buildings. Since one of the functions at First Ops West is to process checks, more and more of its space has emptied as Internet banking shrinks the demand for checks. “We had a building out there that had a lot of vacant space,’’ said Steve Bieber, real estate director for First Tennessee. The Prescott Road building will continue to process checks, but also house account maintenance and a large portion of the bank’s information technology operation. It’s difficult to gauge the impact on the airport area’s real estate simply by adding employees to a building First Tennessee already owns, Bieber said. Downtown, some of the Court-Thomas Building employees will make the short move to the First Tennessee Building. The Dallas-based commercial real estate firm Fischer & Company, which has a long history representing FedEx in real estate, will represent First Tennessee in the sale of the Court-Thomas Building. “We feel we can market it and hopefully somebody will be able to re-tenant the building,’’ Bieber said. Even though the structure is 45 years old and classified as Class B or B-minus, selling it should be “no more challenging than any building in the Downtown area,’’ he said. The effect on the Downtown office market would be “a wash’’ if a company buys and inhabits Court-Thomas, Steffner said. But if it becomes vacant and for lease “it will have the impact of putting space on the market. “… It’s a building that hasn’t seen the market in a long time,’’ Steffner said. “I’m really not familiar with it. It’s got a good location on Thomas. (But) most people who want to be Downtown want to see the river. “It would be a good back-office building for somebody at a cheap price,’’ he said.